‘Tis the season for veggies and Dip! I love making my own onion soup mix and dip recipes because it has wonderful ingredients; no msg, msg, or msg (it’s amazing how many times they add it under different names), preservatives, artificial coloring, or any other junk. It’s great to know how to make your own onion soap mix and dip recipes, not only so you know exactly what is in the food you are eating and giving to your family, but you can make a bunch and keep it in a mason jar in your cupboard and have it on hand whenever you need it. Overall, turmeric is adds a great punch to a homemade onion soup mix and dip recipes! I also use it in a lot more things than just dip, too. and more…let us know what you use it for! Onion Soup Mix is great in Dips, over meat and potatoes, rice, and more. Add all ingredients into a mason jar with lid. Close jar tightly and shake until ingredients are mixed well. ¼ cup is equivalent to 1 packet of onion soup mix. You can use this in soups, meat and rice dishes, and of course veggie and chip dip! 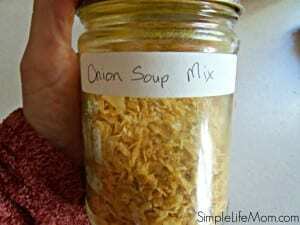 Here’s a quick and easy recipe for onion dip recipe using the above onion soup mix. Mix and enjoy with veggies, potato chips, on baked potatoes, etc. Definitely saving this one to try later! Great recipe! Thank you 🙂 I love the added health benefits of the Turmeric. looking forward to seeing the new site!! Thank you. It’s definitely taken a lot of work…but fun. Wishing you all the best as you launch your new look! Can’t wait to see it! Perfect! I’ve been looking for an onion soup mix recipe – thank you! I used to make a lot of mixes like this, but I found that it stuff added to stuff I needed to find a space for. I usually just make stuff like this on the fly unless I know I have a recipe coming up in the meal plan that will need something. Thanks for sharing with Let’s Get Real (I’m co-hosting this week)! LOL! That’s what mason jars are for! 🙂 They save me a ton of time and help my older kids to be able to cook without too much help from me sometimes. I totally agree. And when you make your own, you can add extra healthy herbs you may not get in a packet. I use a commercial onion soup mix when I make french onion soup. I end up feeling guilty every time because I haven’t found a recipe to make my own. No more procrastinating. This is perfect. Thank you! BTW, I found your blog over at the Let’s Get Real hop. Have a great day! Pinned. 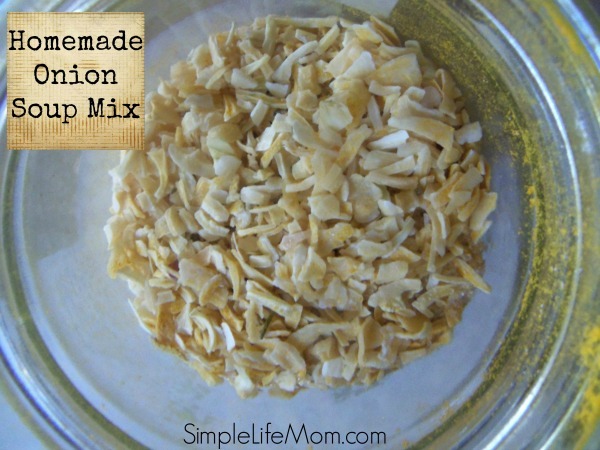 Who knew it was so simple to make your own onion soup mix?! Thanks so much for sharing your recipe. Would love if you came and shared this on Merry Monday tomorrow at 6pm PST. Great idea and a healthy alternative to the boxed mix that is filled with so many additives, preservatives, and toxins. Will share on pinterest. Thanks for sharing on Real Food Friday Blog Hop. I use onion soup mix in my meatloaf once a week so I was so happy to see a recipe for it. I never thought to make my own! Thank you so much for sharing this! Oooh, this would be really good meatloaf. Great idea! Thanks for sharing! This was chosen as a favorite on From the Farm hop! Would love for this recipe to include how you get the dried, minced onion. Sure, if you want to make your own just chop them and spread them out on wax paper on cookie sheet and heat at 170, checking periodically to see when they are dry. It should take a few hours, but you can make a ton at once. Store in an air tight jar or bag. This looks great! We have one more Christmas celebration tomorrow, I think I’ll make this for the veggie platter. Thanks for sharing! It is great mixed into meat for hamburgers and for meatloaf. I added dried porcini mushroom powder to mine. Thanks for sharing this recipe with us Kelly! You gave me some great ideas to use this with. I love the sound of a chicken and veggies and beef stroganoff. Passing this along! Thanks Kelly, I have wanted to make my own minced onions, Now I can. really appreciate it.